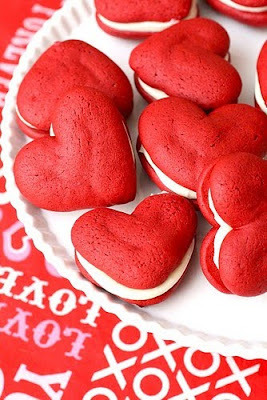 What sweet treats are you making for Valentine's Day? I'm kind of a little disappointed because both of my minnies signed up to bring completely unexciting things to their classroom party. They came home with the lists and I saw the two items...juice boxes and popcorn. When I asked them why they didn't sign up to bring cupcakes or cookies or something fun, something I could make at home, Natalia intelligently replied, "Well Mom, the things have to be store-bought, so I figured that it didn't matter since you wouldn't be allowed to make cupcakes anyhow." As it turns out, things must come from the store complete with ingredient information because of concerns about allergies. Looks like we'll have to bake up some of our own Valentine goodies at home this weekend...and I was supposed to be back on the diet train on Monday...oh well! I'm going to cheat on the red velvet whoopie pies by using a cake mix and a recipe I found on ehow. 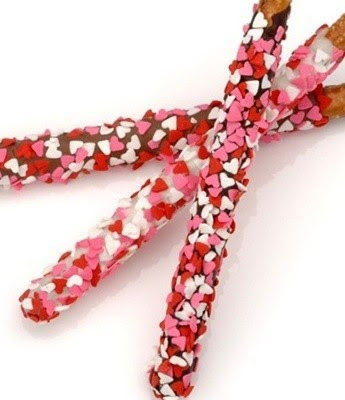 These are as easy as dipping pretzels in melted chocolate and sprinkling with little pretties. Let them dry at room temperature on wax paper. In a little bag tied with a ribbon, it's a perfect little gift. 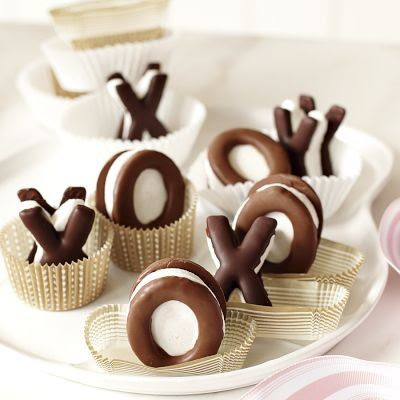 If you're really rushed for time, just pick up these adorable xoxo smores from Williams Sonoma. 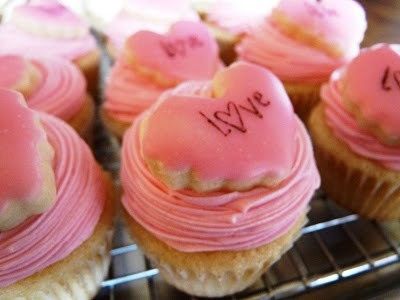 What sweet treats are you baking for Valentine's Day? what great treats!!! Wish I had time this weekend to make something super fancy. But I'll be working all weekend... strawberry muffins for 36 kids is on my agenda for tomorrow evening. Hey, at least they are kind of healthy, right?!! For Ittybit's class I need to make heart shaped sugar cookies for them to decorate and, as their treats, I made milk and white chocolate dipped Oreos with red icing stripes. They turned out really cute. If I had the time, I would do a blog post about them. Also found on Family Fun the cutest little joke printable to use as the tags for the treats. I hate how so many schools want things store bought now. Hopefully, I won't run into that problem.